These basic braids look great as purse handles and are really easy to do. 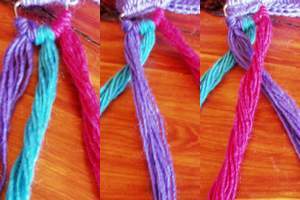 Follow these free instructions and learn for yourself how to make your own braided purse handles. 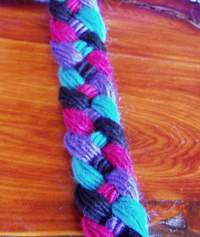 First we'll go for the easier one (they're both easy really) - the 3 strand braid. Measure the length that you want your handle to be, then add one third of that length to your measurement. Then, double the total to find out your "cutting length". If you are felting your bag then you'll need to add HALF of your original measurement before doubling. Cut your lengths as per measurements - the more lengths you use, the thicker your handle will be. For these samples I cut 6 lengths of each color of worsted weight wool then folded them double = 12 strands per color. Once you have all lengths cut, fold lengths in half and tie a loose knot in the folded end to hold them together (or thread them through a 'D' ring if you're using those on your purse. Separate your colors into groups (or mix depending on the look you want). I kept the colors separate so you can see where each group is going. Ok - now hold the knot between your knees or have someone else hold it for you, as you need a little tension, then bring the left hand strand over the middle strand to the center. 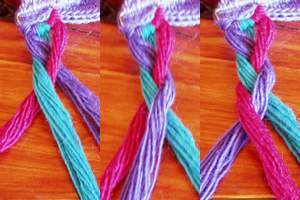 Then bring the right hand strand over the new middle strand to the center. Alternate bringing the outermost strand to the center, and stop when you have about 6 inches left (enough to make a knot to stop your braid from unravelling). And there you have a 3 strand braid. You can thread it through holes at the top of your purse and ties knots on either the inside or outside, and then trim the ends for a basic handle. Now we'll go onto the 4 strand braid - of these two basic braids this one is only a little more complex, but again it would make a lovely effective purse handle as you can see by this picture. The measuring part is the same as the 3 strand braid instructions. You still need to fold your lengths in half and separate your colors, or divide your lengths so that each grouping is the same thickness. Again - have someone hold the knot for some tension and this time bring the left hand color OVER the one next to it to the center, at the same time bring the right hand color UNDER the color next to it. Next, cross the two new center colors right OVER left, and then repeat from step 1 until about 6 inches from the end, then tie off. This one takes a little more getting used to, but it's really effective and a little wider than the 3 strand braid. Try to keep your tension even with all strands - then you'll end up with a neater braid. If your braid is pulled tight it will end up being firmer - great for a handle that you don't want to felt. 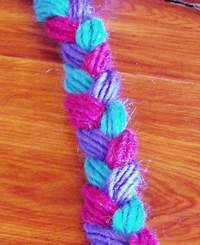 If you want to felt your braid, then work it a little more loosely, so your yarn has somewhere to shrink to. A tighter braid will shrink less. These basic braids look great in leather, ribbon, yarn, jute, hemp, rope, or you could even cut strips of fabric or old clothing to braid for purse handles. Let your imagination run wild!